In the search for improving our smile, one option is cosmetic dentures. The current trends are a world away from old-fashioned falsies or false teeth. Dr. Melvin E. Ring in his book Dentistry: An Illustrated History, records some of the earliest beliefs about dentistry. He also notes the earliest recorded evidence of false teeth. In around 500 BCE the Etruscans were creating gold bridges to act as replacement teeth. The Romans adopted the practice. Over the centuries, it became fashionable to wear gold teeth. Noblemen, pirates and pimps all have sported gold teeth proudly. Yet, the first actual dentures were the product of the Swiss. Some 500 years ago, dentures began to appear in this country. They were made out of ox bones.These might have actually been more comfortable than other later dentures. Some dentists made their replacement teeth from wood. If you were lucky, however, like George Washington you might have had a set created from actual human teeth. Although not a new concept, then and now dentures had a purpose. They provide us all with the chance to bring to life a brilliant smile. They can do so by replacing bad, cracked or misshapen teeth. Like cosmetic dental veneers or bleaching, dentures allow us to take back our smile. Alternatively, they let us create it, as we would like to have always had it. Essentially, dentures are a replacement for natural missing teeth and surrounding gums. They are removable. This makes it convenient for cleaning purposes. It also differentiates them from other related dental procedures or appliances. Implants and bridges, for example, are affixed permanently within the mouth. The same applies to cosmetic dentist veneers. Immediate dentures are placed into the mouth as soon as the teeth have been removed. This accounts for their name. In some instances, they act as a temporary measure until other dentures are put into place. A dentist places conventional dentures in a mouth between 1 to 3 months following the removal of the specific teeth. 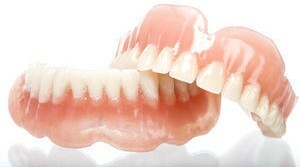 Either type of denture conforms to the need of the client. As a result, it may be a full set of dentures – front and/or bottom teeth, or partial dentures. The latter type replaces a few of the removed or missing teeth. A partial may also be an over-denture. The use of these dentures has an either actual or esthetically based causal factor. Dentures are both a practical way of replacing lost teeth and a cosmetic procedure. Tooth loss can result in a denture or even cosmetic dentistry veneers. So, too can discontent with how teeth look. Depending upon various factors, dentures can be a form of affordable cosmetic dentistry. Like a cosmetic veneer, a denture is potentially capable of designing the perfect smile where one had never been. Yet, selecting dentures over implants is less costly overall than having implants. Implants, however, may help act as a support system to dentures where structural damage or problems make a straight insertion difficult or impossible. Without teeth, we may not only lack the ability to eat our food with ease, we also lose our capacity to smile openly and freely. We may even suffer from a lack of confidence. Technology offers us a chance to change this. Cosmetic dentures provide us with teeth that give us back our smile as well as our skill to “chow down.” Unlike the old falsies, the new dentures are truly realistic replacements designed with your mouth and needs in mind.